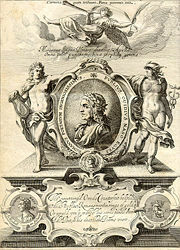 Engraved frontispiece of George Sandys's 1632 London edition of Ovids Metamorphosis Englished. Publius Ovidius Naso (b. Sulmona, March 20, 43 B.C.E. – Tomis, now Constanta, 17 C.E.) was a Roman poet known to the English-speaking world as Ovid. In his own time he was ranked alongside Virgil and Horace as one of the three canonical poets of Latin literature. Ovid is generally considered the greatest master of the elegiac couplet, and, of the great Latin poets, is considered to have the most psychological complexity and depth. His poetry, much imitated during Late Antiquity and the Middle Ages, had a decisive influence on European art and literature for centuries, influencing such luminaries as Petrarch, Chaucer, and Shakespeare. Ovid's poetry assimilated the Greek mythology and traditions of the past, infusing them with a uniquely Roman sense of romanticism (the word itself comes from "Rome", and it is from Ovid that we have the first literary romance); his poetry, like Virgil's, would become a touchstone of the ancient world for subsequent generations of writers to admire and emulate. Little is known for certain about Ovid's life. Most of what we know comes from Ovid's autobiographical poem, the Tristia. Ovid was born in the small town of Sulmo, a village about 90 miles east of Rome. His family was of the well-to-do patrician class, and his father was wealthy enough to send Ovid and his brother to Rome for their education. In Rome, Ovid showed a knack for rhetoric, so he was compelled by his teachers and family to become an orator. However, Ovid could not resist the call of verse writing, and he neglected his studies, much to his father's dismay. Ovid's father sent him to Athens after his graduation, and, after traveling elsewhere through the Mediterranean, he began work as a minor public official. He soon abandoned work, however, to pursue poetry full-time. Fortunately for Ovid, his first work, the Amores ("The Loves"), was an immediate success. It was followed up quickly by his equally popular instructional poems, Medicammina facei (“The Art of Beauty”), Ars amatoria ("The Art of Love"), and Remedia amoris ("Remedies for Love"). The obvious themes of these early poems are love and romantic intrigue, but it is unlikely that Ovid himself was a particularly intriguing or romantic figure. While his first two marriages ended very quickly, he would remain affectionate and devoted to his third wife for the remainder of his life. Following the success of these early poems, Ovid would become a member of Rome's elite circle of poets and socialites. During this time Ovid would count among his friends Tibullus, Horace, and Sextus Propertius. Propelled by his success and the encouragement of his comrades, Ovid began to undertake more ambitious poems: the Metamorphoses and the Fasti ("Calendar"). He was nearly finished with both epics when, in 8 C.E., his life was irrevocably changed. Emperor Augustus, for reasons that are still unknown, banished Ovid to Tomis in modern Romania, on the Black Sea. Ovid himself wrote that he was banished for an error and a carmen — a mistake and a poem. Ovid himself makes clear that his error was not a scelus — that is, it was an indiscretion, not a crime. The most common speculation regarding the error is that Ovid was involuntarily involved as an accomplice in the adultery of Augustus' granddaughter, Julia, who was banished at the same time. The carmen to which Ovid refers, Ars amatoria, was still rather clear in the mind of the public at the time of his banishment, and its somewhat lascivious subject-matter probably did not help his case. ei mihi, quod domino non licet ire tuo! Alas for me, because your master is not allowed to go! After nine years of plaintive exile, Ovid died in Tomis at the age of 60. Ovid wrote in elegiac couplets, with two exceptions: his lost Medea, whose two fragments are in iambic trimeter and anapests, respectively, and his great Metamorphoses, which he wrote in dactylic hexameter, the meter of Virgil's Aeneid and Homer's epics. Ovid offers poetry unlike those of his predecessors, incorporating many myths and legends about supernatural transformations from the Greek and Roman traditions, but with a three-dimensionality of character never seen before. The first example of this is Ovid's early poem, the Heriodes ("Heroines"), which, borrowing an idea from Propertius, consists of a series of letters written by heroines of various myths and legends. The letters are really dramatic monologues, in which Ovid applied the lessons learned in his training in rhetoric, particularly the technique of ethopoiea ("character drawing"), to brilliant effect. The Heriodes in many ways foreshadows the psychological nuance found in the soliloquies of Shakespeare, who considered Ovid to be one of his favorite poets. The rather stiff and antiquated figures of Greek legends are infused with a dynamism and subtlety of conscience never before seen, and entirely unique to Ovid. The greatest example of Ovid's mastery as a poet, however, is his Metamorphoses, a chronological account of the cosmos from creation to his own day. Although it recapitulates many of the Greek and Roman myths as they had already been recorded in Hesiod, Homer, and other, older poets, Ovid was the first (and, in the estimation of many, the best) to cull all the miscellaneous legends together into a comprehensive narrative whole. By the time Ovid had begun the composition of the Metamorphoses, Virgil's Aeneid had already been canonized as the national epic of Rome. In response to this, Ovid realized that in order to create an epic of his own he would, like Virgil, have to find a voice and style all his own. In Ovid's case, rather than centering the story around an immutable—and, to modern audiences, somewhat uninteresting—hero, he would center his Metamorphoses around the theme of transformation, or metamorphosis. Each of the 15 stories in the epic involves a transformation, however minor. The real theme of the poem, however, is not the literal transformation of characters into other forms, but the transformation of character and emotion, as they each endure their own pathos. In the Metamorphoses, Ovid focuses in particular on the transformative emotion of love that he had written about so wittily in his earlier poetry, bringing it to bear on the epic legends of the Greek and Latin literature he had assimilated in his early life. The results are some of the most profound and profoundly human legends ever written. No one poet did more than Ovid to transmit the riches of the Greek imagination to posterity. In his own time Ovid's contributions to verse were largely technical. Ovid was the first poet to demonstrate that the somewhat rigid Latin language could be adapted to dactylic Greek meters. After Ovid, the elegiac couplet and dactylic hexameter would become widely popular modes of poetic writing. In our time, however, Ovid is much more memorable for the clarity of his descriptions and the lucidity of his characterizations. In the Middle Ages and Renaissance, poets rediscovered the Greek and Roman legends not through reading Homer and Hesiod, but through Ovid. In the English-speaking world, many of the stories found in two of the seminal poets of the English language, Chaucer and Shakespeare were drawn (or in some cases, directly translated) from Ovid. The same can be said for virtually any literature in any of the Romance languages. Ovid stands out not only for his gifts as a storyteller and poet in his own right, but as one of the most important sources we have to the literature of the ancient world. Halieutica ('On Fishing') - generally considered spurious, a poem that some have identified with the otherwise lost poem of the same name written by Ovid. in Inferno ranks him side by side with Homer, Horace, Lucan and Virgil (Inferno, IV, 88). (1900s) 6 Metaphorphoses After Ovid for oboe by Benjamin Britten. (1997) An Imaginary Life by David Malouf, the story of Ovid's exile, and his relationship with a wild boy he encounters. R. J. Tarrant, "Ovid" in Texts and Transmission: A Survey of the Latin Classics (Oxford, 1983), p. 257. This page was last modified on 8 January 2019, at 21:16.